MAVEA is the new generation premium water filtration system made in Germany. It integrates the highest quality materials with intelligent design and a revolutionary recycling program that helps sustain healthy lives and a healthy planet. The distinctive European styling makes a statement on your kitchen counter or on your dining room table. The design strikes the perfect balance between form and function while easily and conveniently delivering clearer, cleaner, great tasting water. The MAVEA Elemaris XL water filtration pitcher has a large nine glass water capacity. Our radically new shaped filter delivers consistent flow and filtration over the life of the filter. No pre-soaking is required to activate the filters. The filter media is treated with silver to inhibit the growth of bacteria. Micro-screen in the filter reduces black particle release into the pitcher. 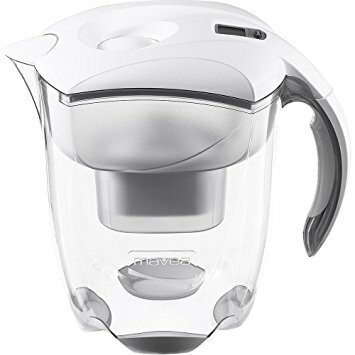 The Elemaris XL pitcher is certified by WQA to NSF ANSI Standards 42 and 53 to significantly reduce chlorine taste and odor along with other unwanted elements. The unique pour through lid makes it easy to fill the pitcher. Simply turn on the tap and hold the pitcher under it. The water flow opens the lid and it closes automatically when the reservoir is full. The MAVEA Smart Meter measures water hardness. water volume and length of time the filter is in use. The Meter takes the guess work out of knowing when to replace your filter. The rubberized feet and handle are molded into the system to provide an elegant and functional touch. The soft handle is comfortable to hold while the feet prevent scratching or sweating on furniture or countertops. MAVEA is the only water filter company offering a comprehensive filter recycling program. If you have any questions about this product by Mavea, contact us by completing and submitting the form below. If you are looking for a specif part number, please include it with your message.